In case you haven’t noticed, lately I’ve had a thing for pork in the slow cooker. Let’s blame it on my love of pork and the fact that it doesn’t rank among the things that make me feel like puking this pregnancy (sorry to have to be the one to reference puking in a food blog post…life is life these days). Today I have yet another slow cooker pork recipe to share. And it’s a good one. 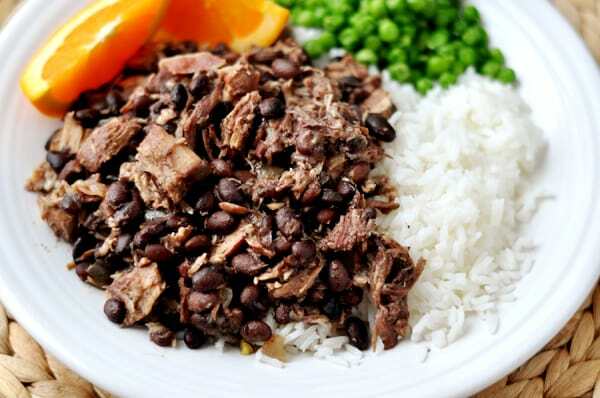 Brazilian Feijoada is a fancy-sounding name for a pork and black bean stew. After my friend, Lesli, referred me to this recipe with rave reviews, I instantly put it on the menu plan. I mean, how could I pass up such an easy no-fuss meal? Especially since Brian lived in Brazil for a few years and I always like to surprise him with Brazilian remakes (uh, usually epic failures truth be told since I don’t have a drop of Brazilian culinary authenticity in my body). Packed with layers of flavor – we are talking, bacon, garlic, short ribs, pork, smoked ham hock – this meal is simple, simple, simple to prepare and throw in the slow cooker. Cooked on low for a good part of the day, the beans soften and cook to tender heartiness while the different flavors of meat meld together to create an extremely delicious concoction. I served this over rice with orange slices and steamed peas on the side. The verdict from the resident feijoada expert? My husband sighed his way through this meal, full of nostalgic memories of Brazil and the copious amounts (and diverse preparations!) of feijoada he inhaled while there. His only critique was the encouragement of a bit more salt and more liquid to make it more of a stew and less of a…well, of a not-stew. Regardless, this hearty, filling and absolutely tasty meal was a hit. So much so that I’m already making it again this week. I’ll blame the quick repeat on baby #5 controlling my cravings, which ultimately leaves me wondering how long I can use that excuse before some insensitive soul calls me out on my claim that baby #5 needs me to eat a large bag of dark chocolate M&M’s every single day. No feedback necessary on that last point thankyouverymuch. Place beans in a small saucepan; cover with cold water. Bring to a boil; cook for 2 minutes. Remove from heat; cover and let stand 1 hour. Drain. Alternately, place the beans in a bowl and cover by 2-inches with cold water. Soak overnight. Drain. Cook bacon in a large skillet over medium heat until crisp. Remove bacon from pan; crumble. Let the bacon cool and then place in a covered container or bag in the refrigerator to use before serving. Sprinkle pork evenly with salt and pepper. Increase heat to medium-high. Add pork to bacon drippings in skillet; cook the pork 1-2 minutes per side until golden brown all over. Transfer the pork to a 6-quart slow cooker. Sprinkle ribs evenly with salt and pepper. Add ribs to skillet; cook 2-3 minutes on each side or until browned. Place ribs in slow cooker. Add drained beans, 1/2 teaspoon salt, onion, chicken broth, garlic and ham hock to slow cooker, stirring to combine. Cover and cook on low 8 hours or until beans and meat are tender. Shred meat with 2 forks (you can do this by removing the pork and ribs from the slow cooker or just digging in and shredding amid the broth and beans). Remove and discard ham hock. Add the meat back into the slow cooker if you removed it for shredding. Stir in vinegar and crumbled bacon. Serve with hot, cooked rice and orange wedges. My husband loved the flavor of this but suggested it needed more liquid to be like the authentic feijoada he enjoyed in Brazil while living there. I liked it as is, since I don't know the difference, but if you really do want it more stew-like, increase the liquid accordingly (perhaps starting with an additional cup of chicken broth). Any idea how long to cook this with a pressure cooker? I would say probably 22-25 minutes high pressure? Feijoida is made with a pressure cooker, not a slow cooker–there’s really no comparison between the two. Hi Dianna, I did quick math with a little help of our anylazer https://happyforks.com/analyzer. Estimated nutritional value for one serving: 708kcal | Protein 62.8g | Fat 26.4g | Carbphydrates 54g | Fiber 8.9g. The numbers may vary depending of exact ingredients you use. For the calculations I used 1 pound of cooked white rice. Any chance you could put the nutritional value for this dish on here? I’m following Weight Watchers and would love to see how many points plus values this dish is… Thank you!!! I made it today and we love it! Sorry, I don’t provide that info but there are a lot of online resources for that. Good luck! I love this meal soooooo much !!! I just made it today. I’ve made it several times before and we always love it !!! I haven’t made it in a while and I had forgotten how amazing it is !! Just wanted to say thanks … Also loving all your new recipes for Christmas time .. So many I’m trying to figure out how to fit them all into the celebrating !! I don’t eat meat (anymore) but you forgot an essencial ingredient and other one: Feijoada is not complete without cabbage thinly sliced. And you need to put some slices of orange too (yes, I know it’s not orthodox). I almost forgot: You need to put some bay leaves inside, the flavour of a feijoada is not the same without it. For us brazilians it doesn’t look like a feijoada just by looking: it must have some green and have the yellows of orange (you can put them in the place after served), there is another think that is wrong seeing the image: it usualy occupies most part of the plate because it’s very liquid like an bean soup, but your recipe is on the right way. Hi Katrina – that sounds like a GREAT meal for Halloween night! I almost always soak the beans the night before just so I don’t have to worry about cooking them when I’m trying to get things in the slow cooker. Thanks, Mel, for getting back to me. This one was sure a hit. My father was born and raised in Brazil; so, feijoada has been a staple food for our family my entire life. Trouble is I never seem to have time to dedicate to a day-long cooking process. I used this recipe a few different times and it’s always turned out deliciously! As a Brazilian (living in Canada) my mom makes this ALL the time – I should mention that this is supposed to be a bean dish so it should really be mostly beans. You’re supposed find pieces of meat in it but yours looks like it’s mostly pork! Also, my mom actually puts bacon (after frying it) into the feijoada with the meat, and you always always ALWAYS put in a dried bay leaf or two – it makes a huge difference in the end product! Other than that, I’m so glad to see people starting to embrace our food – I find it so delicious. My perfect meal consists of rice and feijoada, some picanha (steak) and salad, and of course pastel (fried dough with filling… sort of like a fried empanada?) and pao de queijo (crispy, gooey, chewy cheese bread). You gotta make it with “Brazilian” rice as well! My husband and I both served in Brasil and so I totally know what your husband means about making it a little runnier. I usually cook my beans with quite a bit of water in my pressure cooker and then a little tip I learned and that you will sometimes find on the directions of Brazilian brand beans is to take a fine mesh colander and scoop up some of the beans and mash them with a fork. Don’t do too much or they’ll all be mushy. This thickens up the sauce while still making it runny enough but thick enough! IF that makes any sense! Here is the link for the rice if you’re interested. I don’t pre cook the beans like you did but it’s fine, I just soak in hot water for 10 min for 4 times before adding them to the slow cooker (or pressure pan) so I can remove most of the dark color that black beans have here (brazilian black beans are different). I use only half of the bean package. Anyway, I only use a smoked beef sausage (not spicy) cut into slices and a smoked pork shoulder piece (if you can find it smoked it’s better) but you can add your favorite meat as well (beef and pork only, always better if smoked). I do boil the meat for one minute in order to remove some fat. Put everything together, then I add water to cover it all, 2 beef boulions (find at the latin section on supermarkets) and 3 dry bay leaves. Add some salt at the end, if needed, i like mine salty. Cook on slow for 7-8h (but give it a mix halfway thru). Serve with white rice, pico de gallo (BUT with parsley instead of cilantro), farofa (african flour found at Fiesta, toasted in a frying pan with some oil and sautee onions and salt, for 15 min but always stirring it up), and collard greens (pile the leaves, roll, cut into thin stripes. Saute some garlic and cook the collard in a frying pan for 5 min. Add salt). And yes, add the oranges! Really, this is the traditional side dishes and you will love it! Also for the one that asked about Pao Frances, you can find it fresh at Randalls (they are very crispy/hard from the outside). finally, sorry for the long comment! Keep up the good work! I enjoyed the black bean recipe but I agree with your husband that there is way too little water/stock to cook it properly….8 hrs of so. Triple the stock and add some heat will just about do it for me. I’ll savor it all week…. I love so many of your recipes!! Perhaps my ultimate FAVORITE is your carrot cake recipe. Hands down. THE best. My new year’s resolution (I really don’t believe in them) but I plan on visiting your site and making one of your dishes weekly. I want my family to eat better, less processed foods, yada, yada, yada. Thanks for a wonderful site! Having used many of your recipes in the past, I made this for the first time when company was coming for dinner with no fear–even though she’s from Brazil! She said it tastes authentic. Everyone loved it. My husband couldn’t remember the name of the recipe so he just called it “multi-meat.” There were fights over the leftovers. Wonderful! We had it tonight! I had made feijoada before, but a vegetarian recipe. I like it with pork too!! But you didn’t mention the Brazilian hot pepper and lemon sauce! My veggie recipe says that it can’t be feijoada without it, so I made that and had with your recipe too. Now, I’m not brazillian, but the sauce is amazing with the stew! I thought about sending this recipe to you many times. I had no doubt in my mind you would love it as much as I did! This is by far my favorite slow cooker meal! This little baby is cooking away in my slow cooker as I type! Cannot wait to taste it after work tonight. Have to admit, I have never soaked beans/used dry beans before so I am nervous about how hard they were going into the pot this morning. I soaked them overnight – is that right – that they are softer, but still hard on the outside? Kristin – yes, even after soaking the beans will be very firm. They should soften up in the slow cooker – I hope you liked the end result! I’m brazilian , and I’m living in Canada. My English is so0000000 bad ……..sorry, but I love your Website, and honestly compliments. 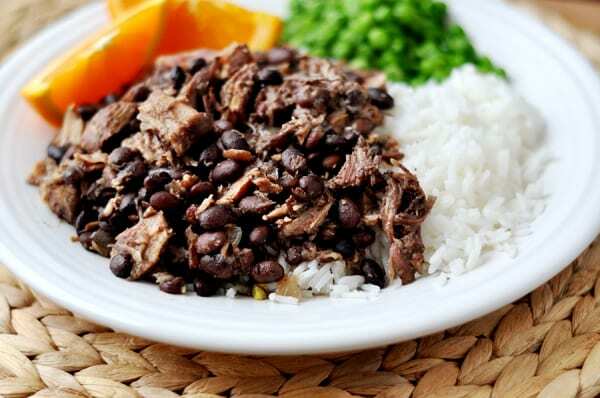 Your Feijoada is amazing “in your american way”. If you want another Brazilian Recipe like “Pao de Queijo”, just send me a email. And Congratulations for the baby. And thanks for all recipes. I lived in Brasil for a year and loved loved loved loved loved LOVED the food! It’s probably what I miss the most – especially pao de queijo and feijoada. 🙂 Your husband is right about there being more liquid (making it more stew-y) – that’s how I always saw it prepared, anyhow. Still looks delicious, though! Congrats on the pregnancy! I actually did tread the recipe but it’s bound to be good! so much pork, so little time. 🙂 this sounds outstanding–black beans and pig are two awesome ingredients and must make for one heck of a stew! Thanks for the reply, Mel. I look forward to trying this recipe. This looks amazing. I love Brazillian beans & rice. I will have to give this a try. I found your blog through the HSBC post. I would love you to link this recipe up over @my blog hop. Thanks! First, congratulations on baby #5! Such happy news. Second, this sounds incredible. I don’t know if I’ve ever made any sort of Brazilian food so I’m extra anxious to try it. This looks delicious and relatively simple. I’m a little bit overwhelmed by the idea of adding pork shoulder, short ribs, and a ham hock. I cook with pork shoulder often, but not so much with the other two ingredients. In fact, I don’t know if I have ever even cooked a whole ham. Is there another way to get a ham hock other than to cook an entire ham? Do you think the meal absolutely requires that ingredient or could I throw in some bacon instead? Jamie – I was a little overwhelmed, too, when I had to shop for ham hock, but surprisingly, I found it at both of my main grocery stores – they sell just the ham hock (smoked or unsmoked and either one is fine for this recipe) so I didn’t have to cook a whole ham to get it. Ask the meat counter/butcher if they have it and you might be surprised. Short ribs are widely available, too. I definitely think the meal benefits from the ham hock flavor but if you absolutely can’t find it, just leave it out. Hi! I’m really appreciating the heart behind what you do. Keep it up. One thought, and I may of course be wrong, but I think a ham hock is also called a pork hock, which is the ankle of the pig. You don’t cook a whole ham to get the hock, I don’t think…that would be a ham bone, wouldn’t it? =) Heh heh, just musing on email. Thanks. Nancy in Alberta – Good feedback although I’m not sure myself – thanks for the alternate idea, though! This sounds yummy, and I love using the slow cooker! Congrats on the pregnancy ~ babies are a blessing. A quick and easy remedy for the nausea is fresh ginger root. You can either just slice off a thin piece a chew it, (if the taste isn’t too strong for you,) – or – add it to a mug of hot water, and sip the resulting “tea.” …and You can still have the M&M’s ~ we won’t tell anyone! YOU ARE A LIFESAVER! My husband too lived in Brazil for a couple years and has often requested some feijoada and I’ve never been able to find a good recipe for it. I know without even trying that this recipe will be awesome. Everything I’ve made from your site has instantly become a family favorite in our house. Now if you could just come up with a recipe for pao de frances (spelling? ), the little Brazilian loaves of french bread, I would forever be in your debt! I cannot wait to make this. We made the lasagna soup the other night and LOVED it, thanks for sharing. Congrats on your pregnancy, too! Might be a stupid question, but what is and where do you get a ham hock? Thanks for all your yummy recipes. You’re my number one go to blog for my menu plans. In fact, about two years ago, my husband commented that our standard of eating had greatly improved (2 years ago is when I started cooking off your blog). Thank you! Hi Nanci – I found ham hock in the pork section of two of my major grocery stores (although at one, I had to ask the meat counter guy/butcher for help finding it). It was kind of hidden on the higher rack of meats but I think asking your butcher can help – my guess is even if they don’t have it out, they can get it for you. Thanks for the sweet email! Mel! Congratulations on your pregnancy! You probably posted it previously, but I must have missed it. I’m excited for you–and am ALSO expecting a baby! My first pregnancy after three adoptions and I can relate to food aversions. When are you due? I’m at 21 weeks. This pork in the slow cooker sounds wonderful and I look forward to trying it. 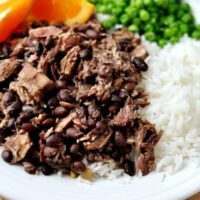 Thanks for a good-looking feijoada recipe–I’ve been looking for one. Now, to really make your husband’s day, make him the Pao do Queijo (cheesy rolls made with tapioca flour) that they have over on the King Arthur Flour blog. And thanks for continuing to cook and blog while pregnant–that shows some serious fortitude. Heaven knows I couldn’t have done that. We ended up eating pizza several times a week while I was pregnant. I can’t wait to make this for my husband who also spent a few years in Brazil 😉 He always talks about Feijoada but I’ve always shied away from it at the mention of “pigs feet.” Now that I know the feet are optional, I will definitely be giving it a try. Congratulations on baby number 5! That’s exciting news! A couple years ago I cooked one meal a week from a different country around the world. For Brazil I had to do feijoada, but I had the HARDEST time finding a recipe that would work in the United States. All the authentic ones I found had pigs’ feet and other weird cuts of meat in them. I modified one recipe I found, but I didn’t remember how, and I’ve been scared to make it again. Now I know where to find a doable feijoada recipe, so thanks! This made me chuckle because black beans and shredded pork have not sounded good to me in this pregnancy but I ate them all the time when I was pregnant with my three year old. As a matter of fact, so many things that I have grown up eating and loved my entire life now sound disgusting to me! Spaghetti, mac and cheese, PB and J and even pizza are just now getting back into our dinner rotation now that I am almost 24 weeks. These look great! I just had a baby a few weeks ago and I love slow-cooker meals! And during the latter part of my pregnancy, my baby NEEDED brownies. I’m talking brownies every day. Homemade. All kinds. No shame! Your growing a precious life, right? Thanks for the yummy looking recipe! congrats on baby number 5! another yummy looking recipe! You never fail us Mel! Love all the flavors in here – such a nice refreshing twist from all the traditional Thanksgiving recipes that are flying around! Mel, I’m chuckling over here and thinking I ought to try this! Ha! This post made me laugh out loud! I love that you are blaming all of your cravings on baby #5! Isn’t it funny what you crave when you are pregnant? This looks delicious, Mel. I can just imagine how good it was with the bacon, the short ribs and the ham hock- YUM!